Hitch Models - Chevrolet/GMC Shortbed/Dually, Chevrolet Longbed, Dodge and Ford Superduty - We manufacture individual models to assure proper fit. Easy Installation - Install the hitch quickly, without removing the truck bed. No welding and minimal drilling on the truck frame. No drilling required to install the hitch on the new Dodge hydraframe. Convenient Fit - Entire hitch fits below the truck bed, which leaves the truck bed flat and unobstructed. 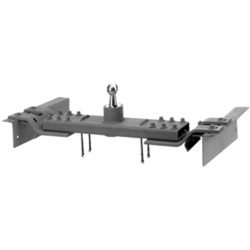 Mounting Brackets Design - Truck model and bed length specific mounting brackets designed to distribute towing forces with pre- punched holes to utilize existing frame holes where possible. Grade Five 1/2" Fasteners - Premium bolts and lock nuts for this load application. Complete Packaging - The Diamond HitchTM is shipped complete with mounting instructions, bolts, brackets, and safety chain loops. When not in use, the Invert-A-Ball stores in the cylinder, which leaves clear cargo access in the truck bed. The ball can be quickly removed by simply pulling it straight up. Locking tab allows visual verification that the ball is locked into towing ready position. Locking lever eliminates wheel well levers or cables. Tapered channels and a 3/4 inch Load Lug eliminates up and down movement of the ball. The Flatbed Kit is delivered ready to install in your Manufactured Flatbed. The kit includes an InvertaTM 2 5/16" Ball Stud and either a 3 1/2" or 5"
Caution: Installation must be performed by a qualified mechanic with technical knowledge of basic mechanical skills. Warning: Product can not be safely used if loaded beyond design ratings. Overloading or overstressing the products constitutes a misuse of the product and Voids any warranties.